You may not touch national sanctuaries. And Johann Strauss is an Austrian, especially a Viennese national sanctuary. But is he only immortal in being Vienna's King of Waltz and the epitome of the Vienna atmosphere, if he is preserved in the comprehension of his 19th century, only close to the original score and so far as possible with original instruments? Do not by any chance underestimate him, if you do not have confidence in him stepping out of the limitations of his Zeitgeist and the techniques of his time, and to be alive and kicking as he had been in his time? Schanibuas Auferstehung! (Schanibuas resurrection!, track 1) What would he have made of it, given the technical and formal possibilities, the electric guitars and synthesizer, the stereo sound and the 24-track record machines? It would not have been him if he had not at least tried them out. Top stars of the Austrian music scene and a – especially for classical treatments prestigious – guest ensemble, who by that became honorary Austrians, assembled to worship Strauss on the occasion of his 150th birthday: sarcastic and sentimental, amiable and vicious. A colourful 'ostrich and arc' ('ostrich' or 'bouquet' is the meaning of the word 'Strauss'. The title “In Strauss und Bogen” alludes to “in Bausch und Bogen” meaning something like “lock, stock and barrel”. The English version probably would have been named "Fine Feathers Make Fine Strausses") has come of it, which bears witness for the unrestricted delight for musical romancing, which adorns our recent “Strausses” with similar feathers as the very “Jean mit dem Rattenfängerblick” (Jean with the Pied-Piper-vision) from the good old days, admired by Brahms and Wagner. As vain as he (Johann Strauss) was with his hair and moustache always coloured black, he would have declared those homages, worshippings and mockings the greatest “Mulatschag” (Hungaro-Austrian German for a hilarious, riotous feast) of all time and would have had his “Strauss-fun” with it. In the following the purchasers of this record are invited to contribute more “Strauss-fun”, i.e. musical or textual ideas most probably like the little poem from Christian Kolonovits printed there. 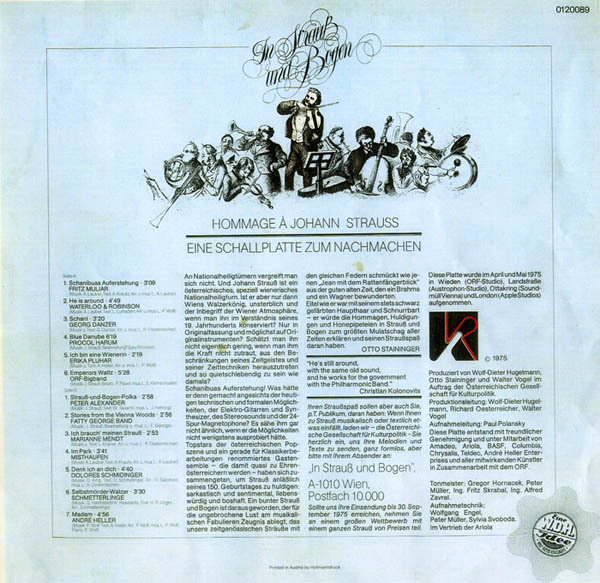 Those contributions to a contest should be sent to the address of the Austrian society for cultural politics with the deadline 30 September 1975 (Sorry, too late for Palers' contributions now; but one should urge them to release the album on CD). I also have my problems with the illustration. 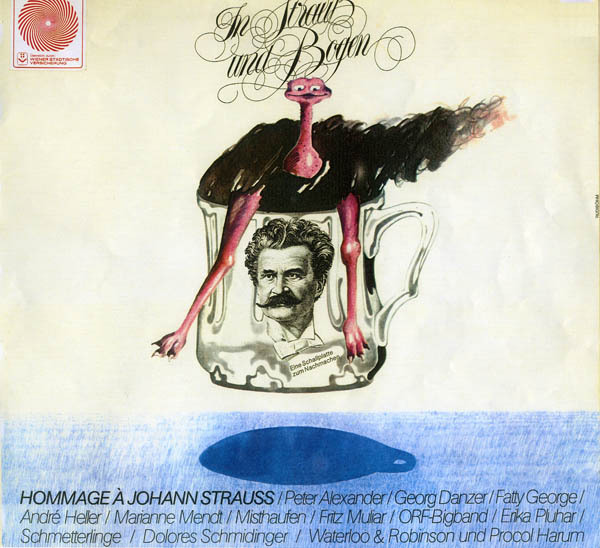 I can see the Strauss but not the Bogen (the grip of the Jar would not make sense). There are two explanations for the origin of the saying 'In Bausch und Bogen'. One comes from paper manufacturing: here the 'Bogen' is a sheet of paper and the 'Bausch' a wad or a puff to drain water from the raw paper, paper and wad alternating in a stack. If you accept something 'In Bausch und Bogen' you take it in an incomplete state. The other explanation derives from mapping of reality: here again you accept something with pros and cons, if you take a 'Bausch' (the excess beyond the limits of a square) and the 'Bogen' (a clipping from the square inside the limits). Thanks to Ian Hockley for sending these photocopies of the album in question to 'Beyond the Pale'. Click on the front and back images to see more detail (perhaps someone would like to send us a translation into English of the German text?). 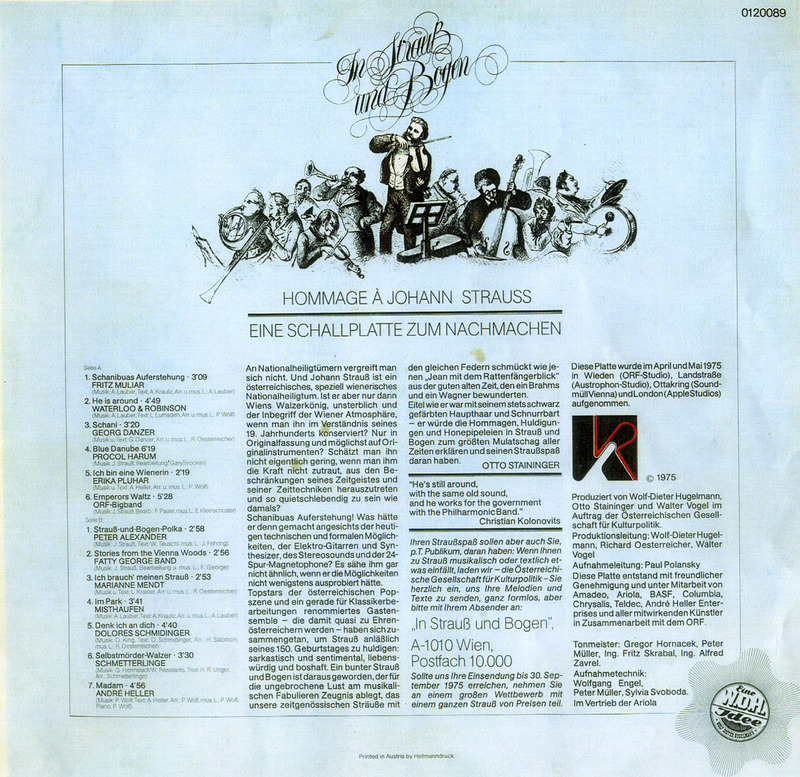 As the track listing (right) shows, Procol Harum's version of The Blue Danube is the fourth item, and by quite a margin the longest piece too. Gary Brooker is credited as the arranger. This track was also released by Chrysalis in France as the 'B' side of a very collectible single: click here for detail. The Procol Danube is also heard on the Repertoire triple-album of the band's single releases: click here for detail.